The long-running era of the Goodyear Blimp has finally ended: but it's good news for airship enthusiasts, not bad. Goodyear has decided to replace its famous fleet of inflatable blimps with more sophisticated semi-rigid "Neue Technologie" ships designed by the modern-day German successor to the original Zeppelin company. NT Zeppelin Eureka, based at Silicon Valley's Moffett Field, on a typical task. 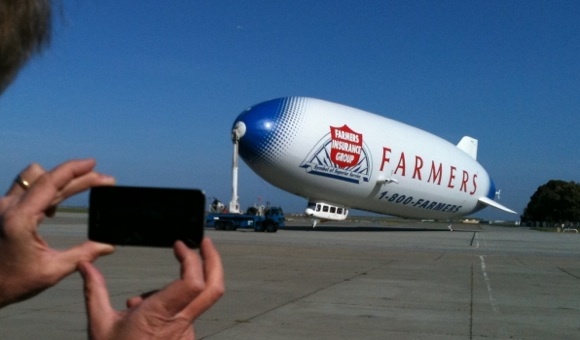 Most present-day airships are blimps like the current Goodyear fleet. A blimp, as distinct from other types of dirigible airship, has no structure supporting the fabric envelope which holds its lifting gas. Rather, the envelope maintains its shape by being kept inflated at a slightly higher pressure than the air outside it, much like a novelty balloon. In the case of a blimp the extra pressure is furnished no matter what altitude or temperature the ship may be at (and thus, no matter what volume the helium lifting gas may care to take up) by blowing air into "ballonets" inside the envelope. Blimps have the advantage of being simple, but the naturally squashy nature of their envelopes presents problems in mounting propulsion and control surfaces away from the main gondola. Beyond a certain size, too, it becomes difficult to maintain envelope shape by pressurisation. For this reason the vast airships of the pre-WWII era were rigid ships, with fabric gas cells contained inside a huge, lightweight shell. Control surfaces and propellers were attached outside the rigid outer structure: so were engines and crew/passenger accommodation originally, but later designs saw everything possible moved inside the hull for better streamlining and easier access. The death knell of the great rigids was sounded by the Hindenburg disaster of 1937 (although her equally-mighty sister ship Graf Zeppelin II continued in limited operation until 1940). It's widely believed that the Hindenburg catastrophe would not have occurred had the great ship been filled with helium – as she was designed to be – rather than explosive hydrogen; but the United States, only source of bulk helium at the time, was understandably reluctant to supply Nazi Germany. Prior to the Hindenburg tragedy, however, the US had made its own experiments with big rigid ships: most famously with the US Navy's flying aircraft-carriers, the Akron and Macon. Each of these was effectively a 1930s-style Captain Scarlet Cloudbase, able to carry a force of biplane fighters in an internal hangar and launch and recover them in mid-air. (The Curtiss Sparrowhawk airship fighters operated above the Pacific without wheels or floats fitted, relying entirely on their "Skyhook" recovery gear). Both vessels were built in the States under a joint venture in which the German Zeppelin company, originally founded at the end of the 19th century by the old Graf von Zeppelin himself, assisted America's Goodyear with the necessary knowhow. That joint venture came under strain with the outbreak of WWII, and the Goodyear-Zeppelin corporation was formally dissolved in 1940. The Zeppelin Company of Germany did not long survive it. The Akron and Macon were both destroyed in storms at sea (in 1933 and 1935 respectively), ending the US experiment with rigid airships. However the US Navy continued to operate blimps with enthusiasm, an effort in which Goodyear continued to play a major part following the breakoff of relations with the Zeppelin Company, and a large US blimp fleet served in WWII and beyond into the early Cold War.